A motor vehicle for use by officers at the Layou Police Station was handed over on Friday November 30, 2018 to Commissioner of Police, Mr. Colin John. 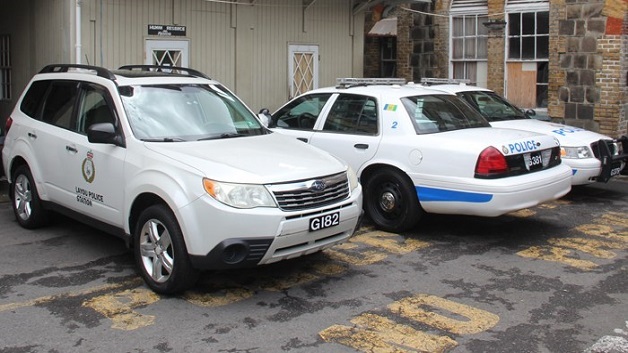 The vehicle, G182, was donated by Mr. Vernon Scott and his wife through the auspices of the Rotary Club of St. Vincent. Addressing the official handing over ceremony held at the Central Police Station, Mr. Scott said it was noticed that there was a need for a motor vehicle transport at the Layou Police Station, hence a decision was taken to make such a donation. Meanwhile, President of the Rotary Club of St. Vincent, Mr. Reuben John said the vehicle will assist the police in their crime fight. He urged the officers to take care of the vehicle and to ensure that its useful life is extended.